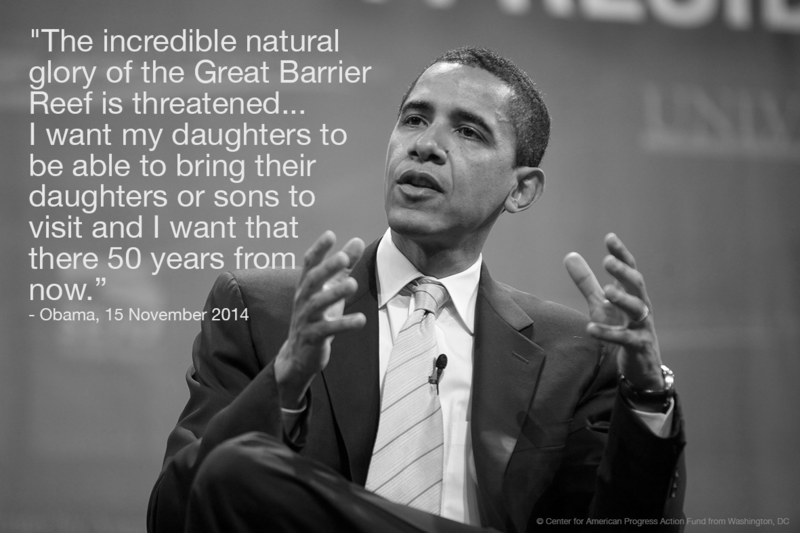 President Obama delivered a broad and sweeping speech at the University of Queensland in Brisbane on Saturday where he’s attending the G20 Summit. Fully one-third of it was devoted to climate change and what the US and others are doing about it. Following on from highly significant joint announcements with China in Beijing a few days ago, the President announced a further $3 Billion commitment to the Green Fund to help emerging nations combat the climate crisis. This was greeted with rapturous applause in a standing ovation. Never before have the leaders of the two greatest and most powerful nations, themselves the two greatest polluters, announced anything like this. It remains, of course, to see if they fulfil these commitments and deliver the reductions in emissions within the timeframe. The Secretary-General of the United Nations, Ban Kee Moon, publicly proclaimed Saturday morning in Brisbane that Climate Change was “the defining challenge of our times” and that the G20 should focus on it. After more than 2 decades of UN efforts on this issue going back to the Earth Summit in Rio in 1992, this is also the strongest endorsement a UN Chief has given – almost in the form of an instruction to the leaders of the world’s 20 biggest economies. Alternative energy has also made significant progress this year. There are some poster-child efforts from electric cars (like Tesla) to solar-powered bicycle paths in Holland. But the underlying reality is much broader and deeper. Over 10% of homes in Australia now have solar panels on their rooftops. Rising electricity prices are driving widespread adoption of more energy-efficient appliances. Over 10% of the commuter traffic volumes in and out of the central business district in Melbourne is now by bicycle. Windmills are showing up all over the countryside all over the developed world to augment grid power. Energy-use awareness has entered the common vernacular in many places. Germany and France have widely publicised their very broad adoption of eco-friendly energy production. People are downsizing their cars and using them less frequently in favour of public transportation, scooters and bicycles. The fight against the climate crisis has started to become a populist movement, particularly among the young and the rich. It’s no longer just cool to be green. Now it’s definitely uncool to be a conspicuous consumer of energy. Populist action at a community level seems to be achieving things that neither legislation or international parastatal organisations could not or did not. No amount of carbon taxation, emissions trading schemes or reports from the UN have reduced actual carbon pollution as much as this people-power movement seems to have done. At the G20 in Brisbane, the President announced that carbon pollution in America is the lowest it’s been for 20 years. Since I first wrote about Climate Change in this blog 8 years ago, something significant has happened. Citizens and society has moved from a more-is-better attitude to energy use to a better-and-less approach. I can see it in my own household. Six years ago, I drove a car with double the per-kilometre emissions twice as much as I do today. For 15 years prior to 2012, I flew frequently internationally and domestically, on business and on vacation. I haven’t been on a plane for almost 3 years. We bought a new refrigerator the summer before last that uses half the electricity the old one did. Even my father is considering putting solar electricity generation into his 20+ year old home! Climate Change 2014 is very different to Climate Change 2006. Perhaps the Global Financial Crisis and its aftermath consequences has made more people in the developed world more frugal. Perhaps the political correctness of being green has had an impact. Certainly greener technology has developed in recent years and its widespread adoption has brought prices down. Maybe all these things have happened. There have been negative things too. Decade-long droughts, very hot summers, depleted urban and farming water supplies in some very wealthy places like California and SE Australia. There have been very severe storms: hurricanes in the Atlantic, typhoons in Asia and cyclones in northern Australia. Some winters in some places like the eastern seaboard of North America or Eastern Europe have been very severe too, while at the same time Alaska has had very warm winters. The last two winter Olympic Games – in Soichi, Russia and southern British Columbia – were starved for snow. The media has done an extremely comprehensive job of broadcasting all this through the established technologies – newsprint and television in particular. New media – social networking on the Internet especially – has done an even better job. The explosive adoption of mobile technologies – mostly smartphones and “phablets” – has made the new media and the old collide in ways never before imagined. Established and newer media players have seized the convergence opportunity in new and better business models to reach an ever-growing and much younger audience. This is precisely the demographic predisposed to the climate change issue and action to combat the climate crisis. A virtuous spiral of the media feeding and becoming the message on climate finds an already engaged generation who want to do more than passively receive bad news and maintain a status quo. If anyone had told me as a university student that the way to meet the looming environmental challenge of the next 40 years was to connect devices on-line with a consciousness in the next generation and the one to follow, I wouldn’t have believed it. Looking back, my ancestors – my auto industry father and grandfather, my uncle and grandfather in the mining business – would have refuted out of hand that a shrunken-down computer with a radio-telephone in it could change the world in such a way. In his G20 speech in Brisbane in front of University of Queensland students, the President mentioned quoting one of their alumni in a tweet on Twitter to his 30 million followers. He is, after all, the most on-line President of the United States that’s ever been. But what got much more adulation was his commitments on climate change and his acknowledgement of the importance of women and gay rights. For all the talk on hard power and the rebalancing of American military resources to the Asia Pacific, climate and GLBT equality seemed to strike a chord with his young audience. That, if nothing else, is cause for great hope for the future.